About the group The group was founded by blind and partially sighted users of Sight Service Gateshead who took part in a partnership project with Britain from Above. The description of this image has been produced by the group. To listen to an audio of this description watch the video below. This picture shows Dunston Power Station in 1935. The design of the building is very modern. The side of the building which faces away from the river is made up of sheets of clear glass. 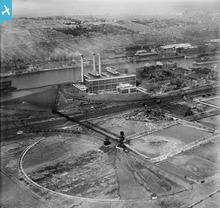 It is an image of the clean new industry which Gateshead wanted to develop in this period. 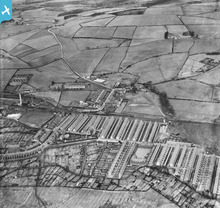 Not far away is the Team Valley Trading Estate which was set up between the wars to bring new industries to the area, as jobs in coal mining declined. The factories on Team Valley would need electricity. Dunston Power Station would have been supplied by coal from collieries in County Durham. On the left hand edge of the picture is the end of the Dunston coal staiths, built in 1890. Coal was brought here by rail, to be loaded directly onto ships from the staith. This video contains an audio description of the image showing Dunston A and B Power Stations in 1935 (EPW049208). Click on the Play arrow to listen to the description and look at the image at the same time. This picture shows the Tyne Bridge as it was being built. The pale concrete towers on the Gateshead side are not finished. These towers had lifts inside them, which people used when they wanted to get down to the riverside from the bridge. The High Level Bridge on the left of the picture provides a wonderful view for people travelling north into Newcastle by train. It also provided a clear view of the great fire which caused so much damage to people and property in Gateshead and Newcastle in 1854. The picture shows St Mary's church on the Gateshead side of the river, near the Tyne Bridge. This area was affected by the fire. The Swing Bridge (the middle bridge) used to sound its horn to warn people it was about to open. The carriageway of the bridge would swing round into the middle of the River Tyne, allowing the ships to pass. The sound of the horn could be heard all over central Gateshead and Newcastle. This video contains an audio description of an image showing the bridges between Newcastle and Gateshead on the day of the opening of the Tyne Bridge in 1928 (EPW025015). This picture shows an elegant area of Gateshead, where new civic buildings were built in the late 19th and early 20th centuries. At the road junction in the centre of the picture is the large War Memorial. The main road is Durham Road. The road leading off to the left of the War Memorial is Prince Consort Road. The large building on Prince Consort Road is the Shipley Art Gallery, built between 1914 and 1917. Next along the road are the Education Offices, built in 1897. At the top of the picture is the new Public Library, built in 1925. The Art Gallery and the Library are still in use today and are well worth visiting. This video contains an audio description of the image of the area around the War Memorial in Gateshead in 1927 (EPW019829). The description of this image has been produced by the group. To listen to an audio of this description as well as some of the participants' personal memories inspired by the image, watch the video below. This picture shows Saltwell Park in Gateshead. The land was bought by Gateshead Corporation in 1876. 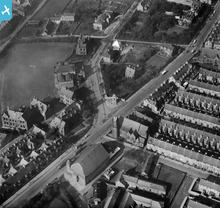 The picture shows Saltwell Towers in the bottom left hand corner of the picture. It was built as the home of William Wailes, a stained glass designer. Joseph Shipley later lived there. Saltwell Towers was a museum, and is now the park centre and tea room. At the bottom of the picture in the middle is the octagonal bowling green. Just to the right of this is the aviary. 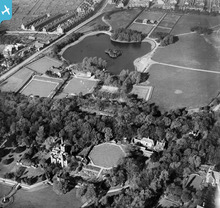 At the top of the picture in the middle is the park lake and more bowling greens. On the very edge of the picture, at the bottom left, the edge of the maze can be seen. To the right of Saltwell Towers there are the geometric patterns of flower beds. It is a lovely park. This video contains an audio description of the image of SAltwell Park in Gateshead in 1927(EPW019830). Click on the Play arrow to listen to the description as well as some of the participants' personal memories inspired by the image while you can look at it. This picture shows the main shopping streets of Gateshead in 1927. We are looking towards Newcastle. The wide street on the left hand side of the picture is West Street. The wide street on the right of the picture is High Street. Jackson Street runs between West Street and High Street. The rounded building on the corner of Jackson Street and West Street was the Co-op until recently. Next to the Co-op shop was a hall. The two large buildings next to the hall were also older Co-op buildings, so most of one side of Jackson Street was the Co-op. St Edmund's Chapel, on High Street, is the oldest building in the area, dating from the 13th century. 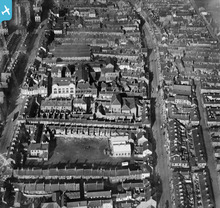 A lot of housing in this area has been demolished, including the old terraced cottages of Charles Street and Grahamsley Street at the bottom of the picture. This video contains an audio description of the image of Gateshead High Street and environs in 1927(EPW019828). High Spen was a mining village. The colliery can be seen on the right hand side of the picture, close to where the railway lines cross the road. There are gantries taking coal from one part of the colliery to another. Very close to the colliery are the rows of colliery housing. In High Spen, most of the houses have gardens. On the edge of the village, behind the main road, there are some new inter-war houses and bungalows. In the centre of the picture is a football ground. On the right of the picture a circular garden feature is part of High Spen Park. The village was in a very rural location, which is why it was classified as Category D, in 1951. This meant that no further investment was to be made in the village, and the population would eventually be re-housed elsewhere, closer to amenities and new jobs. But, along with many other Category D villages, High Spen is here today. This video contains an audio description of the image of High Spen village, Miller's Wood and the Garesfield and Chopwell Railway in 1934 (EPW043821). 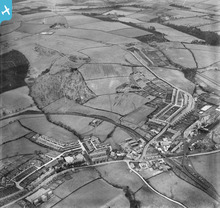 This picture shows the large village of Chopwell in 1934. On the left of the picture is one of the shafts of the colliery, known as Chopwell number 1 pit. Near the centre of the picture is the pit reservoir. At the top right of the picture is St John's Anglican church. The Catholic and Methodist churches are close to the houses. The large building at the bottom left hand corner of the picture was a cinema. There was also a working men's club and a Drill Hall. In 1934 some of the houses in Chopwell had their own enclosed back yards, with outside toilets in the yard, but most of the terraces on this picture had a line of privies in the muddy back lanes between the terraces. This video contains an audio description of the image of Chopwell village and the Garesfield and Chopwell Railway in 1934 (EPW043821). 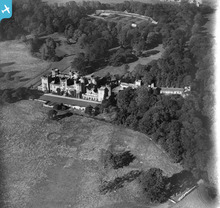 This is a picture of Ravensworth Castle in Gateshead, as it was in 1927. The castle looked out onto a large grassy area which is at the bottom of the picture. Behind the castle, at the top of the picture, there seems to be a walled garden with greenhouses, surrounded by trees. Ravensworth Castle was bought by the Liddle family of Newcastle in 1607. It was turned into an elegant house in the 1720s and improved in the 1750s. In the early 1800s it was rebuilt in the style of a medieval castle, and was kept as a family home in 1919. The Liddles gained the wealth to buy and develop Ravensworth Castle from coal mines nearby. By the 1950s the castle walls were cracking and the foundations were sinking, so it was mostly pulled down in 1953. This video contains an audio description of the image of Ravensworth Castle, Lamesley, in 1927 (EPW019814) produced by the group. Listen to the image description and look at the image at the same time in this video. 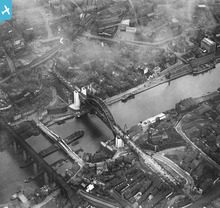 This photograph shows three bridges over the River Tyne in 1937. On the right hand side of the picture is Gateshead. On the left hand side of the picture is Newcastle. The bridge which is nearest the bottom of the picture is the High Level Bridge, which opened in 1849 to carry a railway track across the river. It also carries a road for pedestrians and vehicles below the railway line. The middle bridge on the picture is the Swing Bridge, built between 1868 and 1876, to allow larger ships to pass down the river to Armstrong's works in Elswick. The bridge replaced the previous bridge which was built in Georgian times. It is in the same place as the medieval Tyne Bridge, and is probably where the Roman bridge crossed the Tyne. The bridge nearer the middle of the picture is the Tyne Bridge. It has a very distinctive semi-circular shape. It was built in 1928 to link Pilgrim Street to the High Street in Gateshead. These audios were created by users of Sight Service Gateshead. They came together as they were all acknowledged or budding local history enthusiasts, most of them living in an area close to Sight Service Gateshead at Bensham Hospital. With guidance from local history tutor Dr Dorothy Hamilton, they researched the history of the local area shown in the images from the Aerofilms collection, shared memories the images and the discussions stimulated, and together they produced image descriptions which helped them to explore the images and overcome barriers by their different visual impairments. They decided to call themselves 'Bensham group'. You will find the descriptions of the images they have produced on the website which they uploaded with the help of volunteers. In this group, we have collected all their work and made them available as audio files. The members of the Bensham group hope that their recordings helps other blind and partially sighted people to explore the images they have so much enjoyed themselves.